There are reports that Boris has ditched his idea of an island airport in the Thames Estuary (“Boris Island”) in favour of a huge hub airport on the Isle of Grain. In an interview with The Sunday Times, Boris said the Grain scheme proposed by Lord Foster would “knock the spots off” rival airports on the continent and make Britain the “global capital of aviation”. He is likely to submit 3 schemes to the Airports Commission by 19th July, for Boris Island, for the Isle of Grain and for Stansted. The Isle of Grain is his preference, with some of the new airport built on reclaimed land. There would be a new rail link to London, transferring passengers from Waterloo in under half an hour. The airport would open in 2029 handling 90 million passengers per year and expanding to 180 million passengers per year by 2050. Access to the new hub airport would be by widening most of the M25, an Airport Express rail link to Waterloo, and Crossrail linking it to Heathrow. The entire project would cost about £65 billion – or more. Doing an about-turn on his own pet policy London mayor Boris Johnson is now not so keen on the idea of the ‘Boris Island’ airport. The new transport hub was going to be built in the Thames estuary on an artificial island. Now Mr Johnson is more strongly backing a giant airport on the Isle of Grain in Kent, partly built on reclaimed land. Mr Johnson told The Sunday Times in an interview that it would ‘knock the spots off’ rival European airports as it would eventually serve 180 million passengers a year. The entire project would cost about £65 billion, including a new train line taking passengers to Waterloo in 26 minutes. The Boris Island plan, designed by Global firm Gensler, will remain one of three options that Mr Johnson will present to a government-backed commission this week. The proposed location for Boris Island, artificially created from landfill, would be two miles north of the Isle of Sheppey. Ferries would link the site to Kent and Essex while a railway bridge could connect it to the mainland. The third possible idea would be expanding Stansted. However, Mr Johnson now says that the Isle of Grain plan has the ‘greatest single potential for regeneration’. The blueprint involves an opening scheduled for 2029, requiring infrastructure improvements such as extending Crossrail and widening the M25 an extra lane in each direction for 36 miles. Mr Johnson insisted that Prime Minister David Cameron is ‘open to the idea’ of an estuary airport. On top of those three suggestions, Heathrow will be revealing its own plans to expand with a thrid and maybe even fourth runway. The plans to replace Heathrow have angered many west Londoners who fear it would harm the local economy and result in huge job loses as around 76,600 people currently work there. The [Airports Commission] listening to the various ideas, chaired by former Financial Services Authority chairman Sir Howard Davies, will not publish its final report until the summer of 2015. In April, Mr Johnson said that he would also like to see any future airport named after the late Baroness Thatcher. Mr Johnson’s plans, which rule out expansion at Heathrow airport in west London, will be submitted later this week to the Government-appointed Airport Commission headed by Sir Howard Davies. Mr Johnson said that a new hub airport would be able to support more than 375,000 new jobs by 2050 and add £742 billion to the value of goods and services produced in the UK. 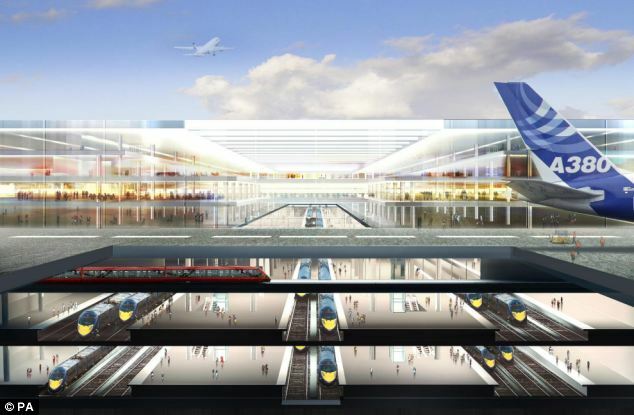 He said a new hub airport could be delivered by 2029, with a hybrid bill being passed by parliament to secure approval for the airport, the surface access and the acquisition of Heathrow. 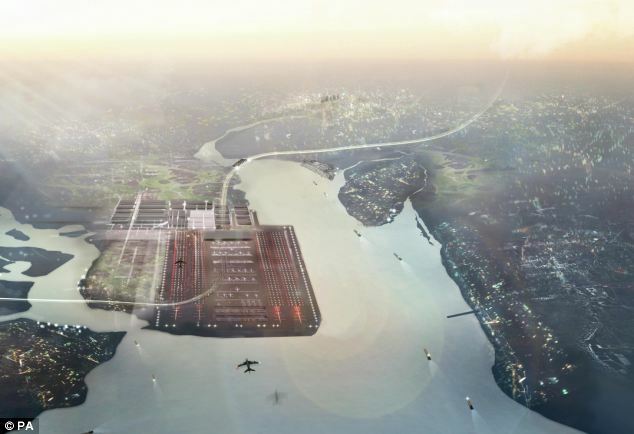 A leading architect today attacked Boris Johnson’s “mad” plan to build a £65 billion airport on the Thames Estuary and compared it to a project that Adolf Hitler might have dreamed up. Sir Terry Farrell, who has designed some of the world’s largest airports and rail stations, said the scale of the proposed four-runway project would be unprecedented in Britain and made the Government’s HS2 high-speed rail project “look like chicken feed”. The Mayor today underlined his commitment to an estuary airport by naming Sir Norman Foster’s Isle of Grain plan as his first choice. Expansion at Stansted was his second choice with a “Boris island” in the outer estuary third. He also wants to shut Heathrow at a cost of £15 billion and create a new London borough for 250,000 residents. Sir Terry’s comments will escalate the tension between Heathrow, Stansted and Gatwick as they go public with their plans to solve London’s aviation capacity crisis this week. Sir Terry, who is working on Gatwick’s bid to build a second runway, told the Standard: “When people say that you have got to have vision, well Hitler had vision. “Vision can be a madness where you get so obsessed you throw everything you have got on the roulette table and hope you got it right.” He said closing Heathrow and moving the predominant London airport to the eastern extreme would be “flipping London”, adding: “In that case people say you could make Heathrow a new town. It makes HS2 look like chicken feed. It’s going to be the biggest project the UK has ever done in its history.” Sir Terry was approached by the Mayor to work on his estuary airport plan but turned the work down. The architect was the chief planner of estuary regeneration scheme the Thames Gateway and has designed South Korea’s acclaimed hub airport at Incheon and the world’s biggest rail station in Guangzhou, China. His buildings in London include the MI6 headquarters, Charing Cross station and the Home Office. Sir Terry, who is also a member of the Mayor’s design panel, added: “The obvious political solution is that he (Boris Johnson) wants the airport to go somewhere that is not in his constituency — out of his voters’ territory.” Last week the architect was hired by Gatwick to promote its proposal to build a second runway. 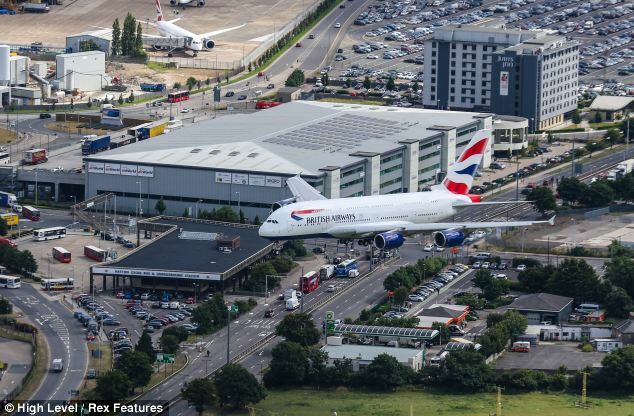 It is part of a grand plan to link Gatwick to two other two-runway airports, Heathrow and Stansted. The plan envisages rail links from Old Oak Common, near Paddington, and Waterloo in 26 minutes. Sir Terry’s “constellation” plan would require two new rail lines linking Gatwick to London but would otherwise rely on advances in traffic management to create a “network” for passengers to move between airports. Sir Terry said there would be an enormous “carbon impact” of moving to the estuary with the relocation of 100,000 jobs and 250,000 people. He said it was on the wrong side of London for much of Britain and would create an extra 100-mile round journey for air passengers. Posted: Sunday, July 14th, 2013. Filed in News about Airports, Recent News.